New York : Avon Books, 1978. 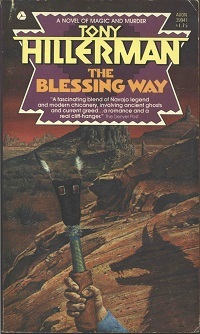 This paperback edition issued by Avon was distributed with two different cover art designs (click the enlarge image link above to see both versions). The Canadian printing used both covers while the U.S. printing used the cover showing a shadow of a wolf. synopsis, reviews, and short author bio,  Other Avon books by Tony Hillerman,  title page,  copyright,  acknowledgment,  blank, -234 text,  blank, [236-240] advertisements.